Doesn’t the month of January just make you want to curl up under a blanket with a good book and a cup of hot chocolate? 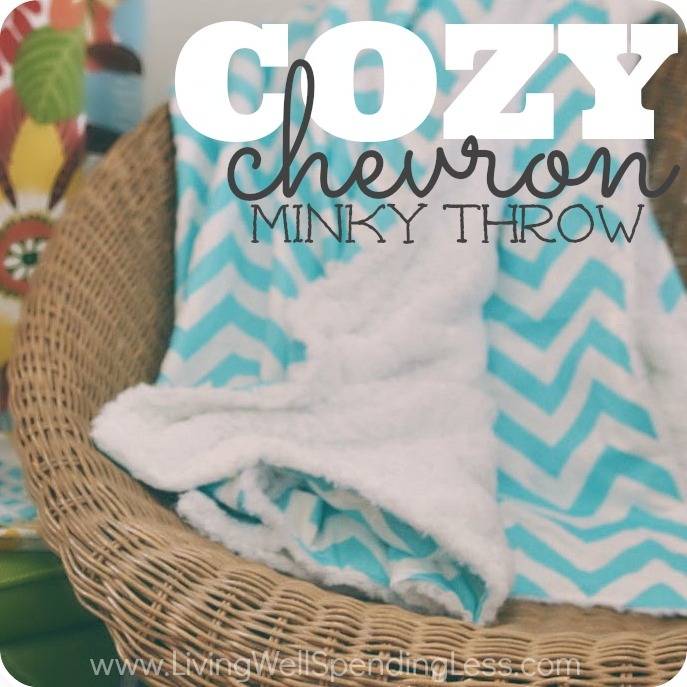 When I started working on my office a few months ago I decided that a cozy throw was a necessity. Inspired my my daughters’ special blankys, which they have both had since they were born, I wanted something super soft and cozy that would keep me warm on the chilliest mornings. 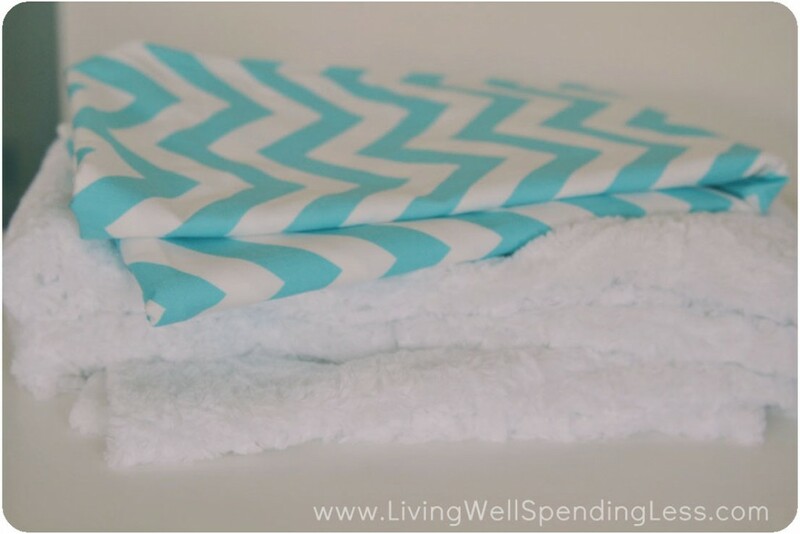 I found some soft white minky fabric on Amazon and decided to pair it with some pretty aqua chevron fabric that I already had on hand. A few straight lines and less than an hour later I had the perfect cozy throw! Step 1: Lay out minky fabric, soft side up, on large flat surface or floor. Spread out chevron fabric overtop of minky fabric, right side down. Line up fabric against corner and 2 straight edges. 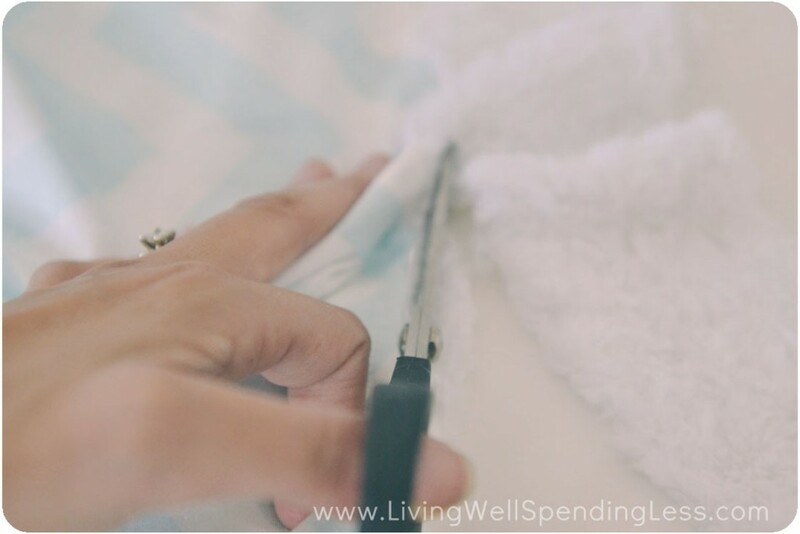 Step 2: Trim excess fabric so that the two pieces are the same size. Step 3: Carefully pin fabric together all the way around. Step 4: Carefully sew along all four edges with a one inch margin, leaving a 12 inch opening along one side. Step 5: Turn throw right-side out through opening. 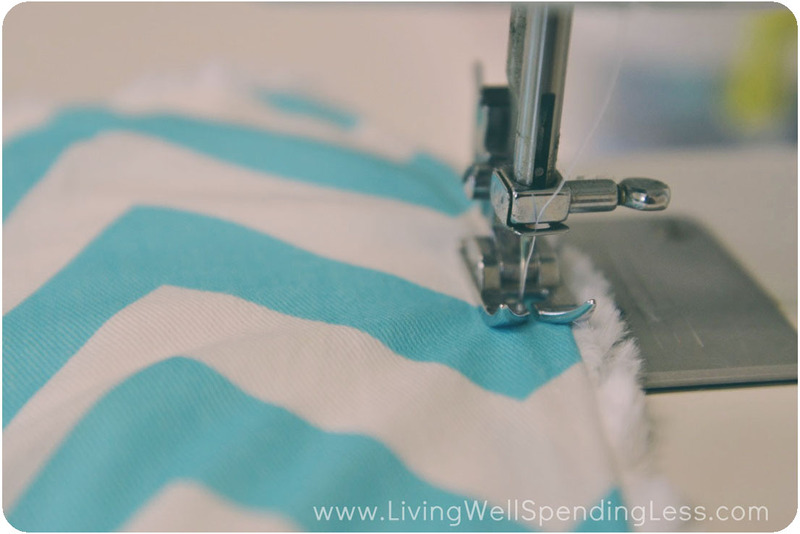 Step 6: Pin opening closed and sew along all four sides, leaving a 1/2″ margin. How do you stay cozy during the cold winter months? This is adorable! Now I want a sewing machine. Great idea, easy tutorial, thanks!! Did you pre-wash both of your fabrics? Cotton and minky shrink at different rates, right, so how will it keep it’s shape? I really want to try this, but I’ve only typically quilted. I’ve done a minky/cotton quilt, but I even added batting and did a stitch-in-the-ditch quilting stitch along my seams. 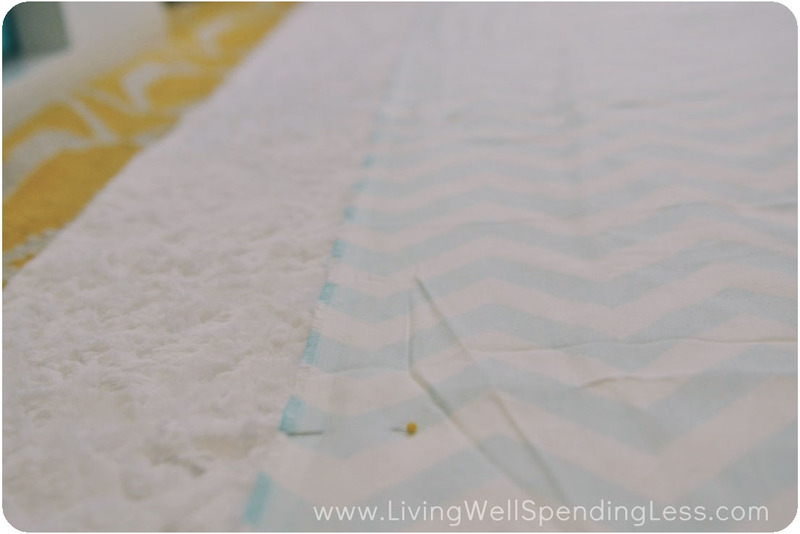 Does the cotton material pull too much away from the minky? Thanks for any tips/info you can give me in terms of how this folds up and washes. Yes I would definitely pre-wash the fabrics! I love this Ruth! 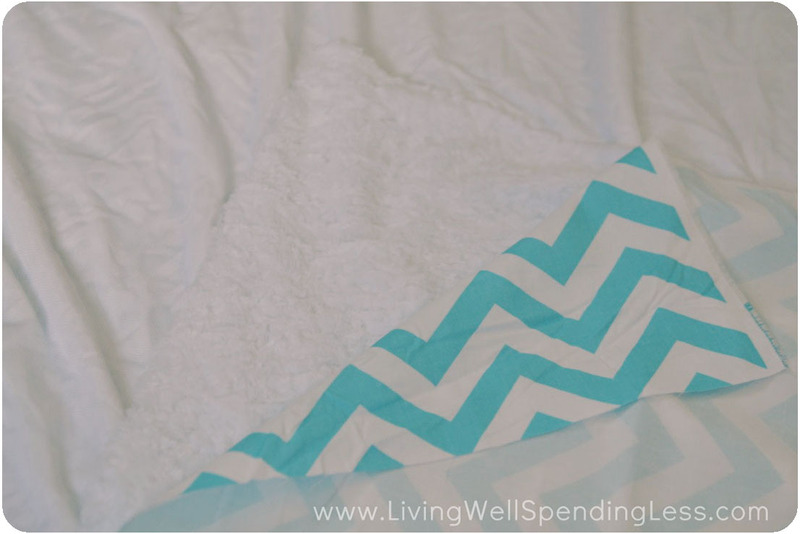 I’ve been looking for a warm throw to go in my bedroom and it’s much easier to find fabric than the perfect blanket. This is such a good idea, I’ll try to make this to my two girls. I bet they will love it! Looks so easy that even I’m not intimidated. Oh so cozy for these cold days up north. Thanks for the tutorial! 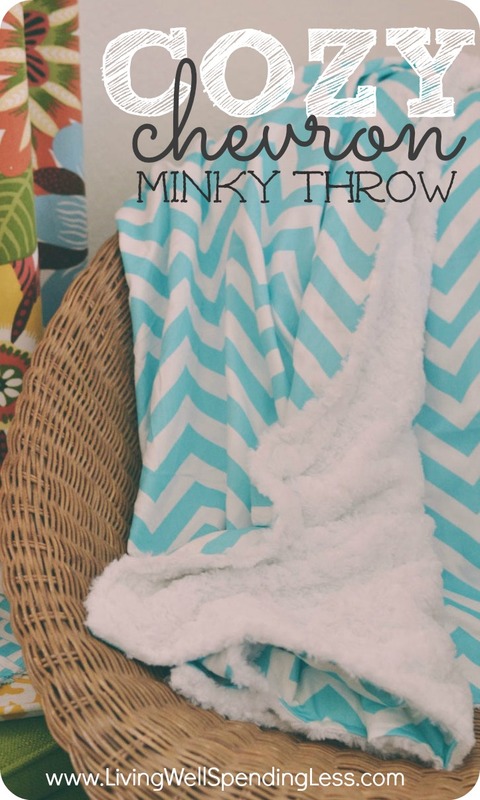 Love Minky Blankets! Great Tutorial. I have been making some for my baby on the way! 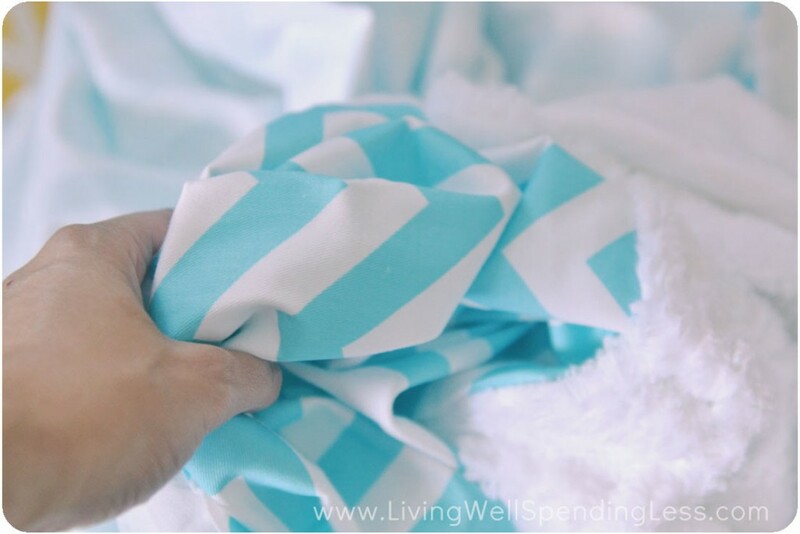 What type of fabric is the chevron? which type of fabric did you use for the chevron material? This is adorable!! Definitely my next project!! I love the chevron fabric. For those of you asking about the chevron fabric. If you click on the link it tells you that it is 100% cotton and where she got it. Love it!!! Question for you- I’ve never bought fabric online- so when you order your minky material- it says its sold by the yard- I can only assume you said you needed a quantity of 2 or 4 depending on how your many blankets your making? 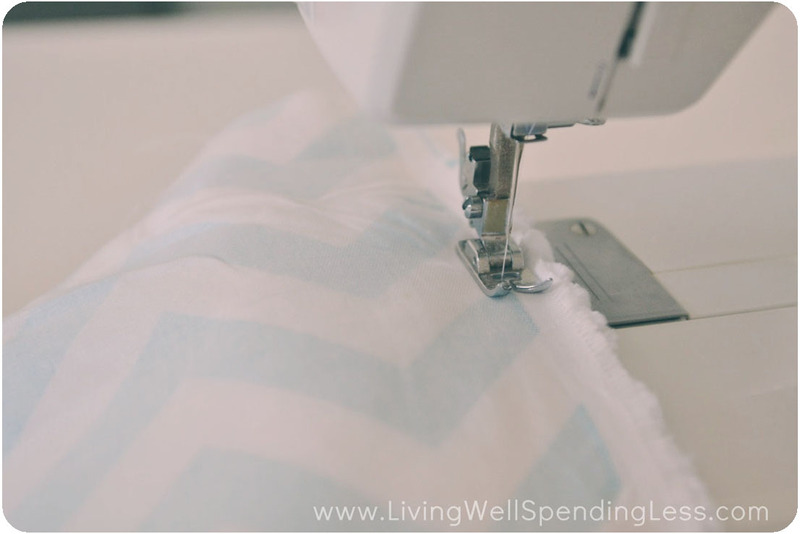 what kind of stitch did you use, does it matter?